At Cedar Dental Centre in Kamloops, our dentists are committed to staying up-to-date on the latest dental technology, to help make your dental appointments more comfortable. In recent years, advances in dental technology have made patients' dental appointment generally quicker and more comfortable, and have also allowed dentists to provide more accurate dental care. Our dentists are always up to date on dental technology to make your visit with us as easy as possible. Dental lasers work by delivering energy in the form of light. 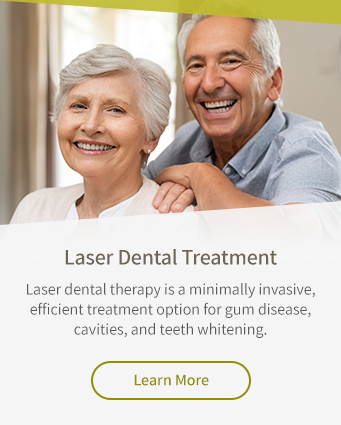 In dentistry, we use soft and hard tissue lasers for a variety of applications, including as cutting instruments or to vaporize decayed tissue. We also use lasers in teeth-whitening procedures to enhances the effect of tooth-bleaching agents. Digital dental impressions allow dentists to create virtual, computer-generated replicas of the hard and soft tissues of the patients' mouth using optical scanning devices. They capture extremely accurate impression data in minutes, without the need for traditional impression materials. Digital radiography is a type X-ray imaging that uses digital X-ray sensors rather than traditional photographic X-ray film. Digital X-rays produce enhanced, highly detailed computer images of teeth, gums, and other oral structures and conditions. Panoramic dental X-rays create a single image of the entire mouth, including the teeth, the upper and lower jaws, their temporomandibular (TMJ) joints, and the nasal and sinus areas. It produces a flat representation of the jaw's curved structure, making it easier to analyze each part. The VELscope is a non-invasive oral cancer screening device that uses fluorescence visualisation technology to help dentists identify oral abnormalities like cancerous and pre-cancerous lesions that otherwise are difficult to detect by the naked eye. Supported by the Canadian Dental Association, it is easy to administer, safe, and produces rapid results. triOS Intraoral scanners scan the mouth to capture three-dimensional dental images in minutes. Intraoral digital scans help dental professionals create accurate physical dental models for restorative dental work, such as dental veneers, crowns, implants, and Invisalign. DIAGNOdent uses a laser diode to examine patients' teeth for cavities. When the dentist shines this light-emitting device on the teeth, it produces a digital readout that can be used to detect decay.